The public in Tbilisi is extremely sensitive to fashion trends, not only in terms of what people wear but also the music they listen to. Often a particular trend, performer or even a song comes into fashion and it becomes ubiquitous for a year. The following year brings in a new favourite and that’s the way it goes on and on. New artists emerge along with new musical trends. But this is one extreme. The opposite extreme is represented by the classics. It is particularly difficult to earn the title of ‘a classic’. The 35-year history of Georgian rock boasts only few classics. One of the most popular groups of the last decade, English-singing Soft Eject undoubtedly belongs to this category. The group has been rated the best for three consecutive years. It has fans in all social strata across the age groups: kids, teenagers, students, middle aged civil servants, businessmen and even retired intelligentsia. And this immense popularity has been earned by hard work and talent, not scandalous behaviour. Tbilisi was conquered slowly but steadily by the members of Soft Eject. Their road to success was organised and professional. Despite the fact that the members of the group met back in 1985, they name 1989 as the birth date of Soft Eject, when they gave their first concert. The composition of the group has not changed much since then - the status of Pecho, who made a major contribution to the creation and development of the group, is still uncertain. The group has gone through continued transformation and today is looking for a new image again. In the beginning everything was the way it was to be. Or the way it happens all over the world - discovery of rock music by means of recordings, the thrill at the first sounds of a home-made electric guitar and, of course, The Beatles, followed by “Simon and Garfunkel”, “Pink Floyd” and several other masters of soft rock. Naturally, the first songs by Soft Eject bear resemblance to the style of these artists, but that is also true of anyone in the world of rock. Soft Eject differs from other Tbilisi rock groups. The feature that distinguishes them most is the group’s intelligence that sometimes results in too much self-criticism. There is no other group in Georgia that works so hard to attain the required tonality. The standards that the group sets for itself are extremely demanding. Soft Eject prefers to remain silent for a long time while working on the kind of music they think worthy. They would lock themselves in their recording studio for years giving no information to the public about their work. But when they come out of their retreat, they always produce valuable and professional pieces - something completely new and different from the music composed in the course of previous seclusions. At first Soft Eject introduced themselves to German public on the streets, very much like the Bremen Town Musicians. Later they played at parties, Catholic festivals, and charity events. They played everywhere, from a wedding party to a brothel, but finally established themselves in nightclubs. According to the group’s bassist Vakho Babunashvili they have performed in all sorts of places “except a wake - but we hope to get there too”. The guys see their German tours as important in terms of financial rewards only. However, it is not so simple. Let us imagine the situations they got into: every day they had to perform in the nightclubs, where the air is dense with smoke and alcohol vapour. They played for the slightly intoxicated public seeking entertainment, the public that has never experienced a deficit of quality artists. And this very public cheered them on and moreover - bought their recordings. This was certainly the best kind of education they could have received, something totally different from what was on offer in Tbilisi. This was not such a vain experience for them because in 1994 they returned to Tbilisi a truly professional group. This period marked the rise of Soft Eject in Georgia. The group itself, however, did not try hard to gain popularity - this came naturally. First there were rumours about a great group. 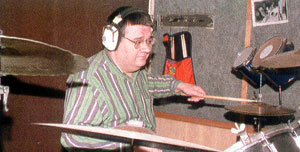 Then came a recording for TV Channel 2 and Radio 1. Later several articles were published in the independent press and... a legend was born. After a short euphoric period the group paused for yet another year. The first serious concert that followed was in the summer of 1996. This was perfect timing in many ways. This was when the first (and so far the only) ten-day rock festival Margarita was under way, in which the group was invited to participate although they never did. Instead they had their own concert for two days in the so-called Gofilect Garden during the Festival period. In a word this was a real success both in terms of attendance and creativity. What made the concert so successful? First of all the intellectual approach of the group members. There are several ways of gaining popularity in the contemporary rock. The easiest one is conquering hearts and minds through attracting the public attention by all sorts of scandals, the most difficult - by creative work. Soft Eject chose the latter and attained its objectives. It is no surprise, therefore, that the group launched the first professional rock-video in Georgia. The video ‘Please Just Carry On’, created by Kutsna Amirejibi, was widely acclaimed by the public. It undoubtedly served as a powerful impetus for the group. The song conquered not only the main target audiences of this kind of music - teenagers and young people, but attracted the attention of their grandparents too. So in terms of “universal coverage” Soft Eject appeared to be a unique group in Georgia. Please Just Carry On had yet another function - with concerts few and far between, it reminded the audience of the group. Something else that places Soft Eject on another extreme is the “weakness” they have - charity. Despite the fact that they have often rejected commercial offers, they never turn down charity concerts. 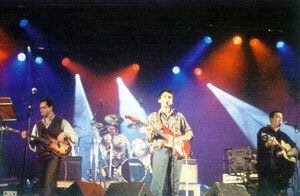 This started in Germany, when they performed for an orphanage, and continued in Georgia - the Greens’ concert, a concert for the students of school No6, and the rock-action in support of TV company Rustavi 2 in Vake Park. The group not only participated in the concert, but was one of the initiators. But all of the above belongs to the past. What is going on in “Softland” (the name the group members call the imaginary world under the spell of their music) today? Good news first - the group recorded a new video that has just been shown on TV. The sad news is that the leading vocalist Irakli Chelishvili alea “Pecho” has practically left - he will only join the group members for concerts. And the last piece of information is that it has been a year now that Soft Eject has disappeared from stage, which could only mean that they are working on a new album. The group has changed its style completely: the guys have rejected the past and are now working on a new creative image. Soft Eject has always been known for their simple and catchy melodies. The new songs that derive inspiration from folklore have inherited this harmony and immaculate taste. Several contemporary rock-artists draw inspiration from folklore today. With the exception of few, they use Georgian folklore. Soft Eject has proved its originality once more by utilising Irish, European and Oriental melodies. The new works represent short pieces and the interesting thing is that a conventional rock quartet is definitely not enough to perform them. This is why there are plenty of musicians, far from the rock music scene, who have been invited by the group - Gia Karchkhadze (guitar and composition), Nodar Manchkhashvili (percussion) and Vakho Babunashvili (bass guitar and composition) and Pecho (we have mentioned his status problem above) - to assist in the creative process. 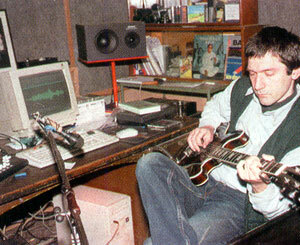 Imagine what their recording studio is like these days - a kaleidoscope of sounds, styles and themes. This may look and sound like terrible chaos for a non-professional, however it is a manageable chaos. And the recordings prove it. Listening to them one realises the amount of talent it takes to be a real musician, who can identify an enchanting sound combination in something that may seem to be noise. The ability to achieve this is a divine blessing for an artist.